I took very little from this. Montaigne, the French Renaissance philosopher, states an incredibly obvious case in that humans are cursed with conflicting emotions. We laugh when we're upset, we cry when we're happy. This may have been an interesting essay in the 16th century, but it's hardly groundbreaking in our day. He goes on to write how words are meaningless and actions are the only thing that matter, enforcing the moral of deeds not words. The irony of Montaigne feeling this as a famous writer was not beyond me. 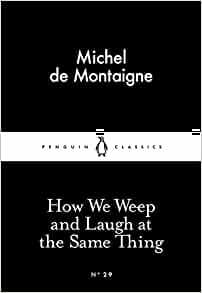 I did enjoy the quotations (kindly translated) in French, Latin, and Greek; most of them quite poignant and relatable. They did well to reinforce his points, but not well enough to let me enjoy his own words. We also learn of our conscious, of philosophy preparing us for death, and the wily ways of Fortune. Incredibly dull; I wouldn't like to have a drink with him.